Chlorine is commonly available in our home as cleaning solution. It is the most common substance used in drinking water and swimming pool treatment. Chlorine in powder or fluid form such as sodium hypochlorite (bleach) may turn into gas if mixed with acidic or ammonia agent.Chlorine gas is a powerful irritant that can cause respiratory problem. In a high concentration it can cause death due to severe lung tissue damage. How do I know that I’m suffering from chlorine gas poisoning? What are the worst conditions can occur due to chlorine gas poisoning? High-level exposure may damage lung tissue resulting in death. How can I prevent chlorine gas poisoning from happening to my family and myself? 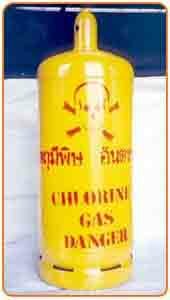 Make sure you understand the warning sign if the chlorine gas release occur. Move away and get to fresh air. Go to the higher places, because chlorine is heavier than air and will sink to low-lying areas. Rinse your eyes with plain water for 10 to 15 minutes if your eyes are burning or your vision is blurred. Enter chlorine gas storage or operation area without safety cloths. Seek medical advice immediately if you experience any symptom mentioned above. What is accreditated medical laboratory?